I haven't tried many places at the UDMC Seafood Centre at East Coast, the seafood hub of Singapore (nor visited it too many times). Mainly because seafood is expensive! Well, on this day (two Sundays ago), I originally wanted to try out the famous Mattar Road Seafood BBQ but hubby did not want to suffer a crowded place with no air-conditioning. So off to UDMC we went, and specifically Jumbo. Oh yes, the black pepper crab was good! Huge Sri Lankan crabs with claws on steroids, yielding plentiful meat that was finger-lickin' good. Drenched in savoury pepper sauce (we wished there was more - is there a world pepper shortage or something?) and with shells cracked at just the right places, we barely needed the tongs. Dang, I'm craving for more right now...but they were pricey, at $43.20 for a 1.2kg dish. Ouch. Cereal Prawn...and they weren't kidding about cereal!, originally uploaded by Camemberu. The rest of the dishes were crap. 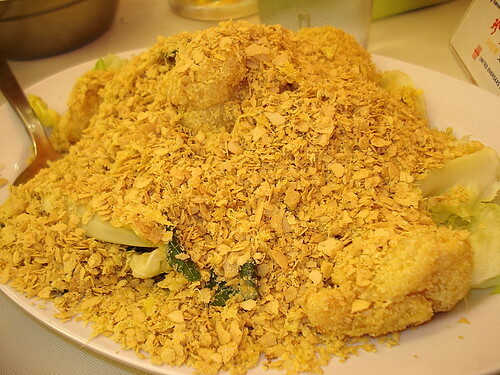 Just look at the cereal prawns (S$16). Seems like the chef just dumped half a tin of Nestum cereal into the thing. This is also the first time I've seen prawns shelled for this dish, and there weren't many either, maybe five or six only. Blandest version I've ever tasted. 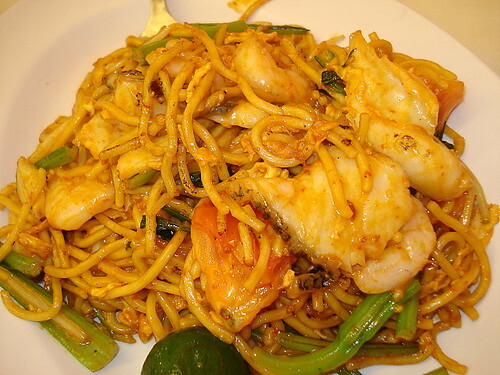 Mee Goreng, originally uploaded by Camemberu. The mee goreng (S$8) came with generous bits and pieces of fish, prawn and squid but was not spectacular. The Punggol Mee Goreng we had at Greenwood Ave is leagues above it. 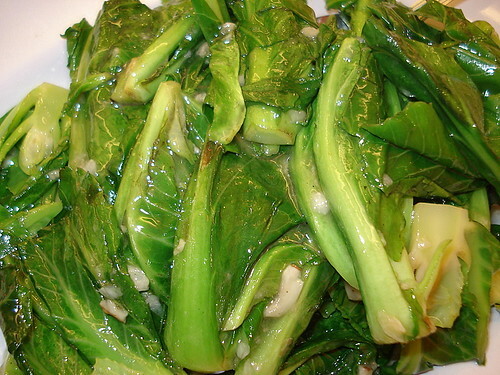 Kailan stir-fried with garlic, originally uploaded by Camemberu. These greens had seen better days, I thought. Some pieces were kinda browning already at the ends. Sure the stir-fry was not badly executed - veges still crisp to the bite - but again, not something you'd lust after. 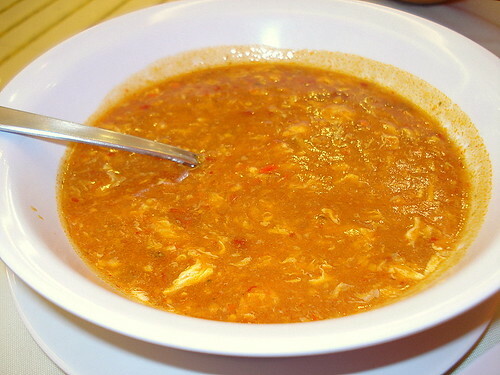 Complimentary bowl of chili crab sauce, originally uploaded by Camemberu. 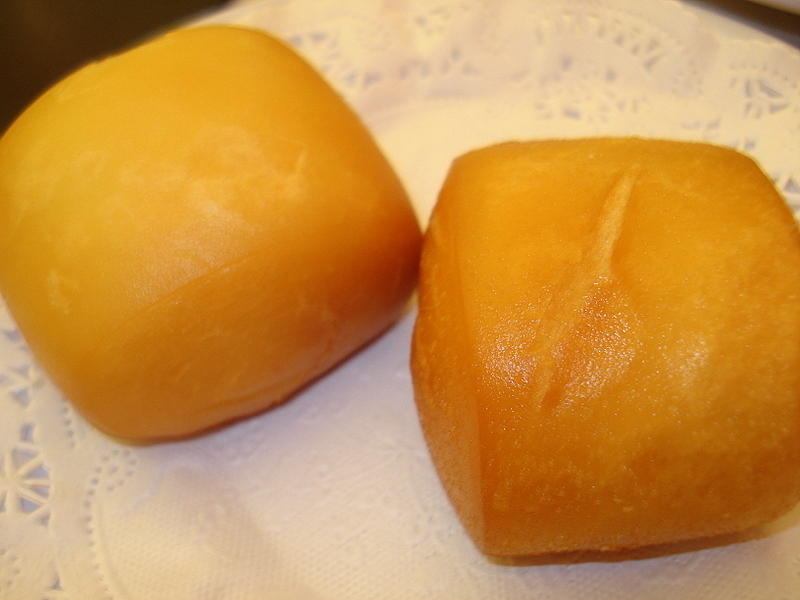 I'm a sucker for those fried mantou (fluffy buns) that always are served with chili crab, so I asked for a couple, even though we weren't having chili crab. The waitress kindly offered us a bowl of the chili crab gravy as a dip. Well, it was an unexpectedly HUGE!!! !~1 bowl. For two tiny buns. Not that I'm complaining. The sauce was sweet and fairly tasty but not really that great, so we were glad we chose the black pepper crab and not the chili one. One thing I liked there was simple harnessing of tech for greater efficiency. The wait staff use PDAs to take orders and the kitchen get those immediately - no delays with walking to-and-fro using paper chits. Before you know it, food starts arriving at your table shortly after orders are done. If only it was better food (the non-crab dishes). Well, I hear Jumbo's quality varies from outlet to outlet, so you may have a different experience elsewhere (we were just too lazy to wander far). I used to like Jumbo and I think their crabs are still OK. But standard has dropped for other stuff and MSG has increased. I have tried the Riverside Pt (a few times) and East Coast branches. They still do roaring business but I think they are now only average at best.... a shadow of their past resting on their laurels. I think most of their business is from work dinners and tourists. Russ, yeah, Jumbo is not what it used to be. The Riverside Point one was quite good too, a few years ago, but I haven't been back yet. I wonder if Long Beach and the others have also suffered a decline? I did not like No Signboard the last time I tried it. i think we go to UDMC for the ambience and "kick". Ambience as in the "monkey see monkey do" feel. i tried Jumbo at the indoor stadium branch, but personally i felt that No Signboard's (NSB) crab is better than Jumbo. ladyironchef, well to be fair, it was the white pepper crab I tried at NSB (Geylang outlet), which still paled in comparison to the black pepper variety. 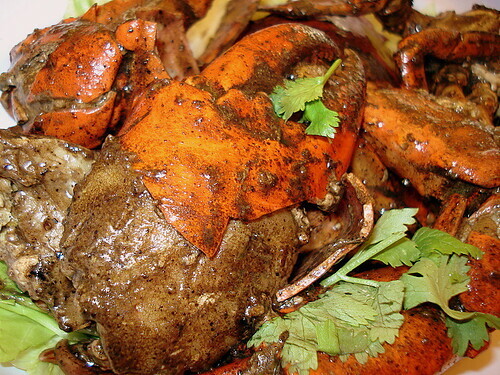 Well, maybe someday I will try the UDMC side for black pepper crab. I think everyone has different thoughts of their fav chilli and pepper crabs. I usually go to the Riverpoint Jumbo. Still quite nice.